There's a camera behind your bathroom mirror, another over your bed, behind your left ear, under your tongue. You're being watched by millions, over dinner, faces lit by the screen. Your whole life is a reality show. You're the dickhead on a power trip, the weakling who pisses himself under pressure, the compulsive crier. Under the eye of the camera, as under God's obsessive stare, you are your worst self. Every time you pick your nose, every stupid confession to your boyfriend is tallied on the crawl at the bottom of the screen. So why not let it all go? Why not go flamboyant, give the gods of your world some real entertainment? Bring out the pogo-stilts and the flamethrower. 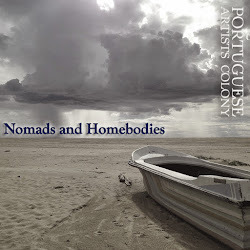 Join Portuguese Artists Colony on March 25 at Hotel Rex as we blur the line between life and performance, if there ever was a line in the first place. Dean Rader’s Works & Days received the 2010 T. S. Eliot Poetry Prize, was a finalist for the Bob Bush Memorial First Book Prize, and won the Writer’s League of Texas Book Award for Poetry. Verse Daily named his poem “Ocean Beach at Twilight: 14” one of the best poems of 2010, and another of his poems will appear in Best American Poetry 2012. He is a professor at the University of San Francisco. Sona Avakian lives in San Francisco and has had work published or forthcoming in ZYZZYVA, Sonora Review, Instant City and Sand Hill Review. 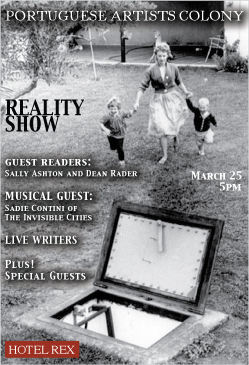 Live music from the fabulous Sadie Contini of The Invisible Cities.